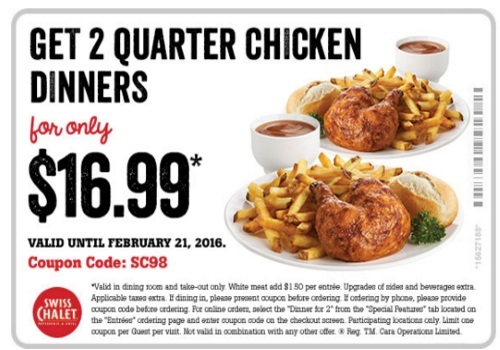 Swiss Chalet has a new coupon just in time for Valentine's Da/Familly Day Weeknd! 2 Can Dine for $16.99 coupon! Get 2 Quarter Chicken Dinners for only $16.99. There's also a coupon available (at the link below) for 2 for $20.99 delivery dinner, if you prefer to have your food delivered. This included 2 Quarter chicken dinners and 2 cups of soup for $20.99. Enter the promo code SC101 at checkout. Click here to get this Swiss Chalet coupon. Click here to order Swiss Chalet online.